To kick off the New Year with a bang, the GLL Sport Foundation kindly agreed to host the Great Britain and Northern Ireland Transplant swimming team at Parkside pools, Cambridge on the 23rd and 24th January 2016. 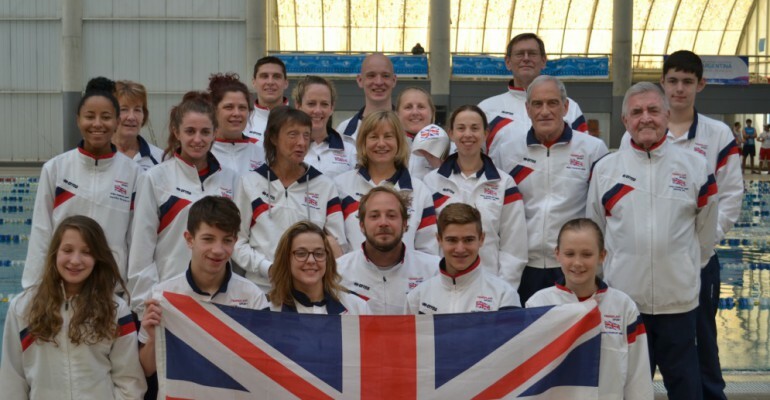 The weekend was a great opportunity for the team to reunite after their outstanding performance at last year’s World Transplant Games in Argentina in August 2015, where 22 swimmers picked up 61 golds, 25 silvers and eight bronze medals, dominating the medal table and setting over 20 new transplant World Records. The swimming team congregated in Cambridge from all over the UK, and included athletes from all age groups and backgrounds but all with one thing in common; they have all had life-saving organ and bone marrow transplants. Because the team are spread across the UK, they cannot often train with each other. The Swimming team Coach, Jeremy Latham says “As well as providing a great opportunity to train and see where everyone is with their swimming, the weekend also helped introduce new swimmers into our very friendly team. To help with this, as well as the pool time we have, we also had lots of team based activities planned, including group punting on the River Cam”. The weekend started with a two-hour swim session coached by GB & NI swimming team coach Jeremy Latham. With such a diverse mix of swimmers it was difficult to pitch a session that catered for everyone. However Coach Latham went over the basic drills and skills that form the basis of competitive swimming, including dive starts from the state-of-the-art Olympic standard starting blocks at the GLL venue. After the swimming it was time to introduce the swimmers and their supporters to the beautiful sights of Cambridge, by the best possible way to get around in the city – by a chauffeured punt! The group of 36 tourists filled three punting boats, and were given an insight into the history of the buildings that form the colleges of the world-famous University of Cambridge. The group all expressed their delight after the tour, and were all very thankful for the great weather they had. Then, after a bit of free time to explore the city, the team gathered once more for a team meal, before going back to their hotel for the night. The Sunday saw an earlier start at the pool with a similar drills and skills session, to help consolidate the teaching of the day before, however this time there was a relay competition between the swimmers at the end of the session. 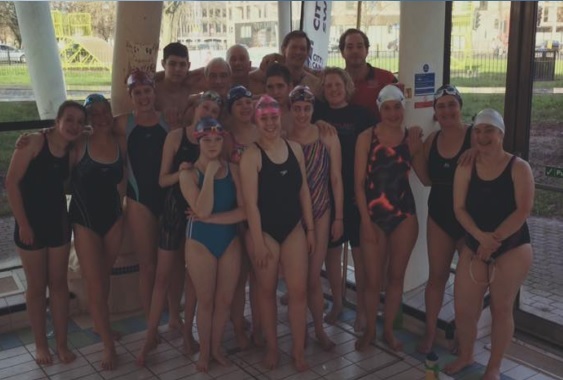 City of Cambridge Swimming Club Coach, Simon Morley who was warmly received by the swimmers, took half of the swimmers for the two-hour session. After the swimming it was time for the team to make the short walk across Parkers Piece to GLL’s Hobbs Cricket Pavilion. Here, two of the younger swimmers delivered a fantastic presentation about their experiences at the most recent World Transplant Games in Argentina. The presentation, along with a video montage, served to evoke feelings of nostalgia amongst the swimmers who also went to Argentina, but it also served to inspire those who did not go to Argentina, and give them an idea of what being a swimmer at the world transplant games is like. The final stages of the weekend saw the team take part in a few team games, including the reaction time game and the snowball game, which both helped to cement further bonds between the swimmers. The weekend was a great opportunity to help the swimmers prepare for the team’s next big international events; the European Transplant Games in Finland this summer, and then the World Transplant Games in Malaga, Spain in 2017. Liam Barnett, liver recipient and GLL sponsored athlete, said “It is so important to encourage people to take up sport and aspire to be fit and healthy after transplant. Weekends like Cambridge are important for transplant recipients, as we can share our experiences and offer support to one another and show the world what is possible in life after transplantation”. At the end of the weekend many of the swimmers and supporters were very emotional and spoke about how much of a good time they had had, but also how useful the weekend had been. 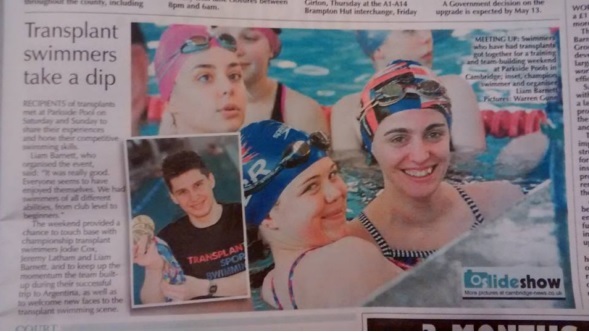 One of the younger swimmers wrote on facebook “So after an amazing weekend with my transplant family I can officially say I’ve had the best time of my life!” The weekend was also a success in terms of media coverage and the promotion of organ donation. On Friday morning, Liam Barnett had a studio interview with BBC radio Cambridgeshire and again on Saturday morning, Coach Latham interviewed with BBC radio Cambridgeshire, both to explain what was happening over the weekend and to help promote organ donation to a live audience. In addition, Cambridge News covered the event with a pre-release in their issue on Thursday before the weekend, and then after the event on Monday 25th January.